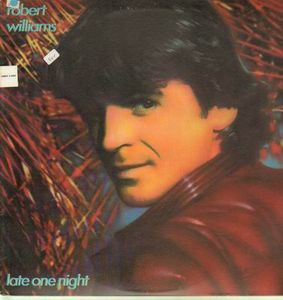 Music for Maniacs: ROBERT WILLIAMS "Late One Night"
Former drummer for Captain Beefheart's Magic Band, Robert Williams, followed up his debut solo EP with this 1982 full-length. He's still joined by some Zappa/Beefheart sidemen, (e.g. : Bruce Fowler's mighty trombone) but he's deffo moving towards a more commercial New Wave direction here. On side 2 that works just dandy. "Gotta Be Nice," featuring Danny Elfman and two Go-Gos (Charlotte Caffey and Jane Wiedlin), should have been playing out of every store in the Galleria. "Grinding The Gears," featuring Hugh Cornwall of The Stranglers, is likewise killer. The tribal throb of "Hungry" is reminiscent of Adrian Belew's classic "Big Electric Cat." Perhaps A&M Records wasn't the suitable label for this album. Or perhaps Williams lacked an outrageous enough personality (and stage name) to make it as a New Wave punker. But whatever the reason, with neither the Freak Scene nor the Valley Girls buying this album, it died a quick death, never getting a digital reissue. My 99 cent used vinyl copy was in great shape. Williams would not make another solo album for many years. and his brief tenure as a PiL sideman, spectacularly ending on the Judge Judy show.